What would you say to a standard four-seat popular car of two-liter capacity that could clear 125 mph with the verve of a sports car, and reach a standing quarter-mile in 16.2 seconds? in the 1970s, a popular answer in some quarters of the european car-buying public was lets tool down the autobahn in the 2002 turbo. 1-2-3 charge! development chief alex von falkenhausen applied turbocharging to bmws basic engine, with breathtaking results. The turbine was placed low on the engines exhaust side and fed compressed air to an intake manifold through a long pipe. Nothing fancy there until you took the jazzed-up 2002 out on the road, where the top-end acceleration was smooth and the cruising power steady. forward and backward like all bmws, the 2002 exuded a carefree confidence. Its front air dam looked provocatively racy. One early test model even bore the inscription turbo in backward script so that drivers of the cars in front of it could tell through their rear-view mirrors just what kind of monster they were up against. The 2002 may not have been the first turbocharged engine, but it became the model for the rest. 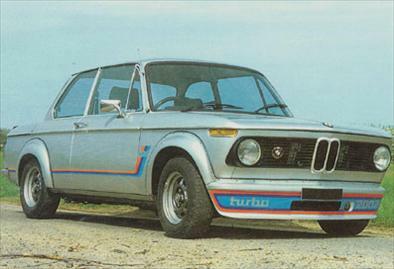 Ever since the bmw2002 turbos 1973 debut at the frankfurt auto show, the term turbo has been in vogue for touring cars.